Title: "In honor of Larry Hurlbert"
My husband, Larry Hurlbert, served in Vietnam from 1969 to 1971. We were married in early December, 1969, and he left for Vietnam before Christmas. Larry was in the 25th Military Police Company, which was attached to the 25th Infantry Division. 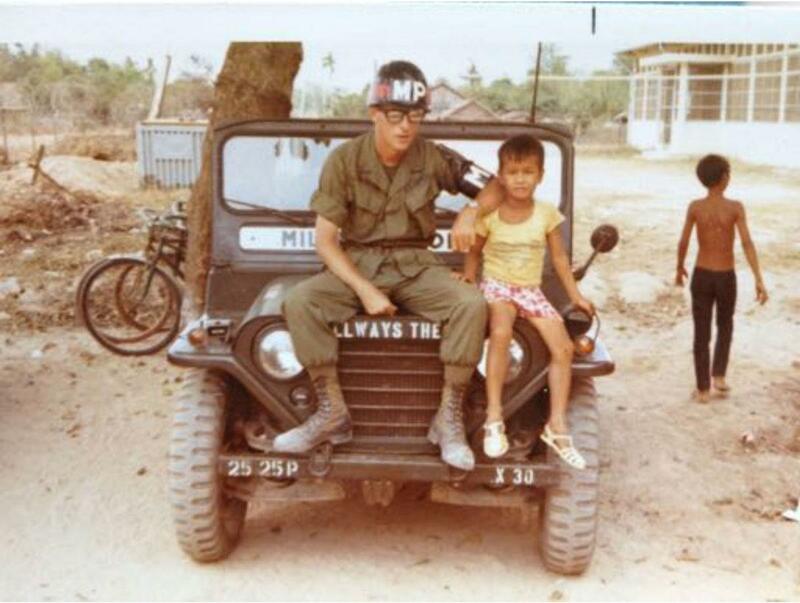 For part of his tour, he was stationed at a large base in Cu Chi. When President Nixon announced the Cambodian incursion, I was terrified that Larry was part of it, because of the location of Cu Chi. Much later he did confirm that he was there. Towards the end of his tour, he spent some time at Xuan Loc. From the tone of his comments, I got the impression that it was more dangerous than Cu Chi. At the end of his time in country, Larry elected to extend his tour by a short period of time, two months as I recall, so that he would not have to serve any additional months after returning to the U.S. When he was a “short-timer,” I was very fearful. At the time, I knew no one among my acquaintances or family who had a family member or friend in Vietnam. Because of the prevailing attitudes in our country, I was reluctant to speak about my fears. I also felt that no one was interested in hearing about Vietnam; no one wanted to know about it. At the time, I was teaching in a local high school. One of my students was helping to organize an antiwar protest. He asked me if I would be willing to participate. I recall that I answered something like “I can’t do that; I can’t show disrespect for my husband’s service.” But I did not disrespect anyone’s desire to protest. I still remember my student’s kind, apologetic response. He showed more respect than most people. When Larry returned to St. Louis, he went immediately into the airport men’s room to change into the civvies he had asked me to bring for him. In retrospect, it breaks my heart to think that he was worried about someone showing disrespect. At the time, it was just the way it was. Larry and I were among the lucky ones. Since he had graduated from college and made contacts related to work before being drafted, we were able to make our way. In all the years that followed, he did not speak of his service in Vietnam, except in the most general manner, when asked a question. However, he was always interested in any news, movies or other mention of Vietnam. When we went to see Platoon, I cried and asked if it was like that in Vietnam. Larry’s response was “pretty much.” One time in the 1970s, someone at a dinner party we attended asked him if he had killed anyone. I don’t remember him making any response at all, and I was angrier than I had even been in my life that anyone would ask such an obscene question. In 2012 Larry died of a rare and unusual cancer. During his fight against the disease, he combed the Internet for information on whether exposure to Agent Orange might have affected his health. I found a file folder with this information among his effects. Although in the end it didn’t matter, it saddens me that he thought there might be some connection. When he died, I asked for a military service at Jefferson Barracks. He had to be honored, at last.